Download the updated toolkit here. Using VOCA funds for web sites, social media, mobile devices, and more. 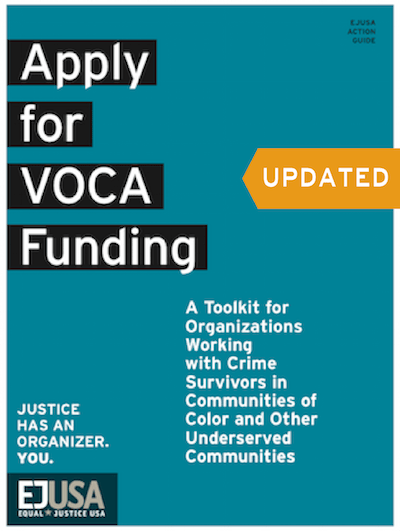 VOCA funds represent a unique opportunity for groups that have been supporting survivors in their communities, but who do not yet have the funding to fully deliver critical services. Review the toolkit and get a sense if your organization may be eligible. If you need assistance with technical questions regarding how your organization may be eligible for VOCA funds, contact our Grassroots Capacity Building Specialist, Latrina Kelly-James at latrinakj@ejusa.org. You can read the full revised VOCA Rules and Regulations on the Federal Register.